The company's momentum hit a snag stemming from uncertainty about the economy and disruptions caused by weather. Check out the latest Genesee & Wyoming earnings call transcript. Shares of Genesee & Wyoming (NYSE:GWR) lost 11.1% in value last month, according to data provided by S&P Global Market Intelligence. 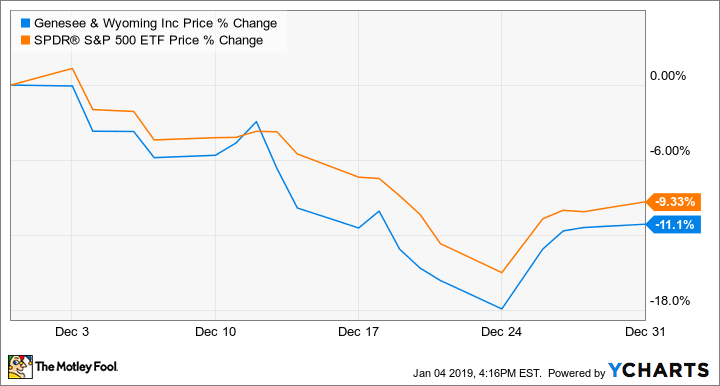 The stock still managed to outperform the S&P 500 for the year, in which the index dropped 6.35% in value as compared to a loss of 5.98% for Genesee shares. Overall, Genesee had a strong 2018, but recent fears of an economic slowdown caused the stock to begin tumbling at the beginning of October. In December, the company reported that rail traffic (excluding acquisitions and divested operations) was down 0.2% year over year in November. That broke a seven-month streak of growth in same-railroad traffic. The stock price had been up 15.6% year to date through September, as a strong economy caused rail traffic to pick up in the middle part of the year. The company reported solid earnings results through the first three quarters of 2018. In the last quarter, it delivered solid revenue growth of 4.6% year over year, which translated to a boost in non-GAAP operating income of 14.3% over the year-ago quarter. During the company's third-quarter conference call in late October, management said uncertainty remains around agriculture shipments from the impact of tariffs. That unpredictability caused a softening in growth, but management still saw signs of a healthy economy, for the most part. Also, Hurricane Michael caused major disruptions to the company's rail lines in Florida and Georgia. Management expects the damage from the hurricane to cause a loss in revenue in the fourth quarter, but for the lost income to be recovered next year from the company's business interruption insurance policy. In general, analysts remain optimistic about the near-term prospects for Genesee. The consensus analyst estimate is for a rise in non-GAAP earnings per share of 21% in 2019. On the top line, analysts are forecasting for revenue to climb 5% over 2018. Trading for a forward P/E of just 16 times next year's earnings estimates, the stock is inexpensive, and it probably won't recover until the uncertainty about the economy clears, especially as it relates to China-U.S. trade relations.